December 19, 2015: Weekend Tours of Phoenix Commons Now Scheduled! http://www.phoenixcommons.com/wp-content/uploads/calendar.png 150 150 Kryspin Turczynski http://www.phoenixcommons.com/wp-content/uploads/logo1-1.png Kryspin Turczynski2015-12-14 15:34:072015-12-14 15:34:07December 19, 2015: Weekend Tours of Phoenix Commons Now Scheduled! 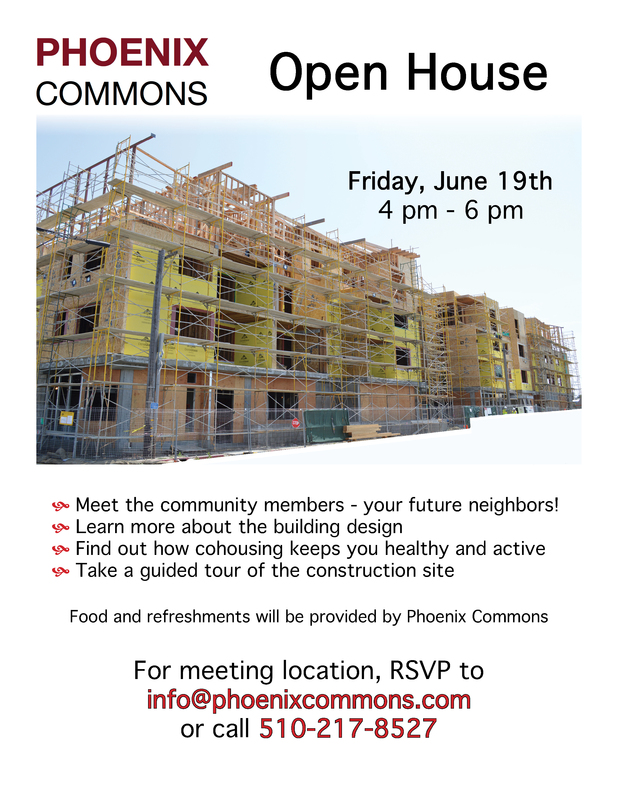 We know you are interested in the opportunity to join the Bay Area’s first senior cohousing community, so come join us this Friday, June 19th, from 4 to 6 pm for a Phoenix Commons Open House! Community members and development staff will be on hand to answer your questions, and walking tours of the construction site and surrounding neighborhood (Jingletown) will be available. Hors d’oeuvres and beverages will be provided by Phoenix Commons. To RSVP for our Open House and for the address of the meeting location, please contact us at info@phoenixcommons.com or call (510) 217-8527. We look forward to seeing you there! Don’t Miss Our First Open House for Phoenix Commons! Save the date for Saturday, May 30th, for our very first open house! 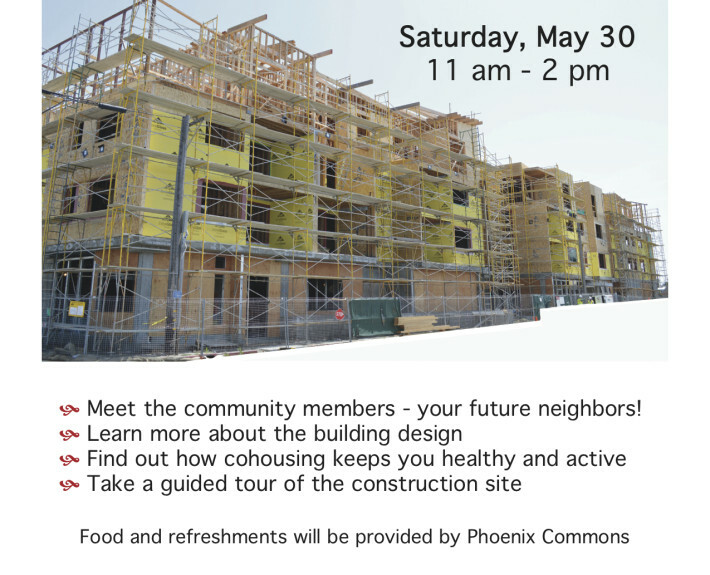 Come and meet the community members and development team, learn more about the building design and how it encourages a cohousing lifestyle, and take a guided tour of the construction site. Food and refreshments will be provided by Phoenix Commons. 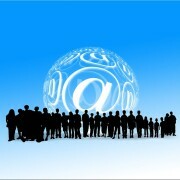 To RSVP and find out the meeting location, contact us at info@phoenixcommons.com or call 510-217-8527. Come find out what sets us apart from every other 55+ community in the Bay Area! 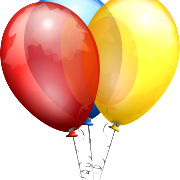 http://www.phoenixcommons.com/wp-content/uploads/balloons-25737_640-1.png 640 562 Kryspin Turczynski http://www.phoenixcommons.com/wp-content/uploads/logo1-1.png Kryspin Turczynski2015-05-15 12:14:362015-05-19 08:52:08Don't Miss Our First Open House for Phoenix Commons! As the first senior cohousing community in the San Francisco Bay Area, Phoenix Commons is attracting members from other parts of California, the United States, and even from overseas! Most of them are planning to relocate to the Bay Area in order to be closer to family; all of them are drawn to Phoenix Commons for its unique community culture, state-of-the-art design and convenient, walkable location. Those of you who have been following Phoenix Commons know about our commitment to education and conscious aging. All community members complete the Aging Boldly in Community (ABC) workshop series presented by our nonprofit partner, Elders Village. Now, thanks to the marvels of modern technology, they can attend the workshops virtually via webcam! It is so inspiring to see Baby Boomers embrace their “Third Age” and join together intentionally to create an environment that will support their independence and social connection in the coming years. The senior cohousing movement is still in its infancy in the United States, but it is growing rapidly and it’s exciting to be at the forefront! As exciting as it is to see the physical construction of Phoenix Commons, the true heart of the community is its members. With over 34% of the future households already signed up, we have quite a few members on board and they’re making their presence known! In addition to business meetings, committee meetings, and a monthly social, members of Phoenix Commons are often present at Bay Area fairs and meetups dedicated to healthy aging in community. They contribute their time and energy, not just to promote Phoenix Commons, but also to just talk to folks in general about the benefits of aging in an intentional community and to make connections with like-minded peers in the region. This coming Saturday, August 16th, Phoenix Commons will have its own table at the 6th Annual Lamorinda Aging Symposium, held at the Lafayette Orinda Presbyterian Church from 8 am to noon. Admission is free, so come and learn more about the Bay Area’s most exciting senior housing project from the folks who could be your future neighbors! 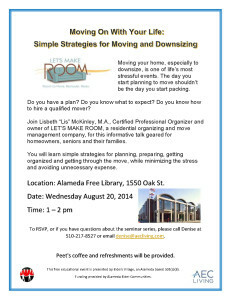 Come to a free seminar featuring Lisbeth “Lis” McKinley, M.A., Certified Professional Organizer and owner of LET’S MAKE ROOM, a residential organizing and move management company. 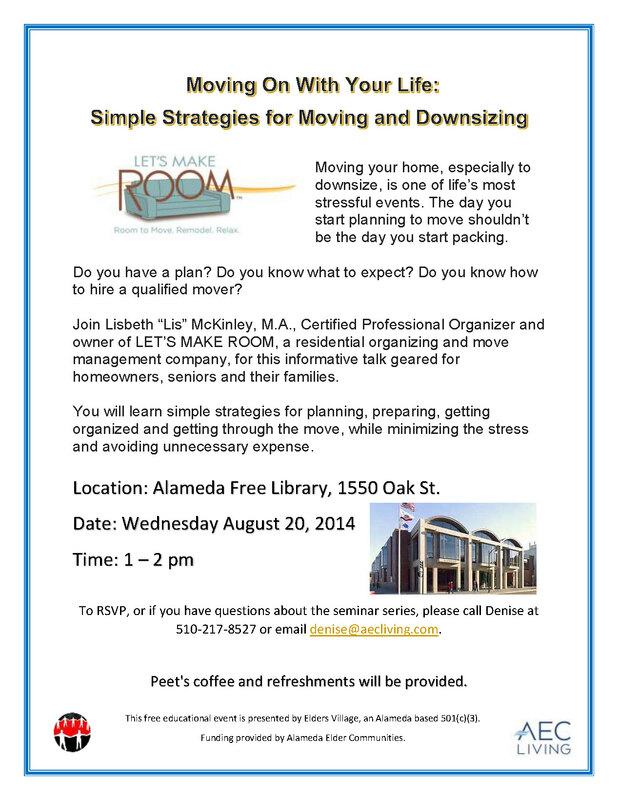 This informative talk is geared for homeowners, seniors and their families. You will learn simple strategies for planning, preparing, getting organized and getting through the move, while minimizing the stress and avoiding unnecessary expense. Do you have a plan? Do you know what to expect? Do you know how to hire a qualified mover? Peet’s coffee and refreshments will be provided. RSVP, or if you have questions about the seminar series, please contact Samantha at 510-217-8527 or email Samantha@aecliving.com. The Elders Village Talks series is our FREE, educational seminars on topics we believe to be of importance or interest to seniors, as well as to their friends and families. Phoenix Commons, our new senior co-housing community being built on the Oakland/Alameda waterfront, is offering core group members the opportunity to lock in the current pricing for those people who join the community by Friday, August 1, 2014. 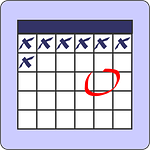 Due to increasing construction costs, prices will be going up about 5 percent as of Saturday, August 2nd. Updated price listings will be offered to members who join on or after August 2nd. Becoming a Phoenix Commons owner is a three-step process, beginning with joining as a member of the core group (the $500 membership includes a position in the selection queue, meeting attendance, Successful Aging course and financial qualification). The second step is the Unit Reservation Deposit ($3,000), which reserves your selected home unit and is applied towards the 20% Final Deposit, which is Step Three. Please call the Phoenix Commons office at 510-217-8527 or contact us at info@PhoenixCommons.com for more information and to join now. Do you have questions about Senior Co-housing? Come to this event to learn more about co-housing and what is available for seniors. Lauren Zimmerman-Cook, CFO of Phoenix Commons, will discuss the growing trend of senior co-housing. As part of the team putting together the Bay Area’s first senior co-housing community, Lauren will explain how this solution addresses the unmet housing needs of seniors and embraces the importance of living in community. Pre-registration required. Please call Mastick Senior Center to reserve your seat. Mastick Senior Center on Tuesday, April 29, at 1:00 pm in Room D.
http://www.phoenixcommons.com/wp-content/uploads/logo1-1.png 0 0 Denise Marshall http://www.phoenixcommons.com/wp-content/uploads/logo1-1.png Denise Marshall2014-04-25 10:53:502014-08-14 14:23:01Do you have questions about Senior Co-housing? We are pleased to announce the groundbreaking ceremony on Thursday, January 9th to celebrate the construction of Phoenix Commons, a new senior cohousing project in Oakland’s eclectic Jingletown neighborhood along the Oakland-Alameda Estuary. The first of its kind in the Bay Area, Phoenix Commons is a 41-unit cooperative lifestyle community for seniors that offers resident-owners the unique opportunity to create a community together that reflects their values, needs and aspirations for the next chapter in their lives. Join us in celebration of this truly innovative and inspirational community-building project. We are pleased to announce that we will be sponsoring another addition of the Successful Aging Orientation on Wednesday, December 18th at 6:30 pm. This class, led by Elders Village, will establish the need for education and training on aging issues, provide an overview of the entire course curriculum, and examine the rationale for emphasizing community throughout the course. Please come join us for this exciting and insightful course. Phoenix Commons is a cohousing community on the Oakland waterfront, located at 340 29th Avenue. We are right off the Park Street bridge directly across from Alameda. For more detailed information please call us at 510-217-8527.